Notifications can be found under the Engage menu. 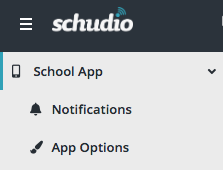 Select School App and Notifications. On the Notification page, any previous notifications will be listed. To add a new Notification, click the green "+ Create Notification’ button at the top of the page. Below is an explanation of the fields on the Announcement details page. The title for the Notification. It should be short and snappy, but explain what the notification is about. The date the notification will will be published. The notification will be given the publish date of the date entered here. If this is a date in the future, it will not appear on the website until the publish date. The time that you want the notification to be sent. This allows you to schedule notifications to be pushed through to the app at specific times throughout the day. This allows building up of announcements that are ready and will automatically go live on the appropriate date/time. There is a notification run every 5 minutes so it may take up to 5 minutes for the notification to be received. This image is the thumbnail image that appears in the messages listing in the app. Ideally it is an image related to the content, having an image for content dramatically increases interest in that content. We recommend use of a landscape image, the system will select the top bit of the image for the square thumbnail preview. This description is the short bit of taster text that appears under the title in the "messages" section of the app. It should reveal some more about the announcement, but be interesting enough for users of your site to want to read the whole article. The content box is the main body of the notification. This is the same text editor present on most of the editable content pages in the Schudio CMS. For more detailed instructions on using the text box please click here. The publish checkbox is ticked by default and allows the content to be shown. If the publish checkbox is not ticked the content will not be shown. To automatically delay the date at which the announcement will be shown, use the Date field at the top of the page.